Keermont intends to create wines that reflect the beautiful place from which they come and the particular year’s vintage conditions. The wines are made as naturally as possible with very little irrigation in the vineyards and minimal intervention in the winery. The estate has been owned by the Wraith family since 2003. Two thousand and five saw the start of a major vineyard-planting programme on lands that had been fallow for a number of years. Seventeen hectares were planted over four years to add to an existing eight hectares of older vineyards. Keermont’s official maiden vintage came in 2007. The farm is situated high up in the picturesque Blaauwklippen Valley, otherwise known as Paradyskloof (Paradise Valley). Due to the steepness of the terrain, the altitude climbs 200m within the 1.7km length of the farm and the vineyards are planted between 250m and 400m above sea level. Thus the vines planted over these different terrains ultimately produce wines with good complexity and a variety of flavours. 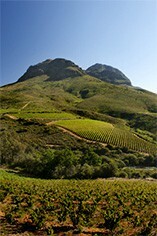 In addition, the proximity to False Bay and the Indian Ocean also moderates the climate in the vineyard. Winemaker Alex Starey is in charge of the vineyards and making the estate’s wines. Employed at the start of the redevelopment of the farm in 2005, he has travelled and worked in wine regions including Maipo Valley in Chile; Penedès and Priorat in Spain; and St Emilion and Cote Rotie in France.